Olive Branch Cafe - A Moroccan style dining. I was introduced by my colleague who staying nearby Ara Damansara. He said, he discover this Moroccan style dining and its was great, fantastic! The cafe are lead by a Moroccan who married to malay wife. 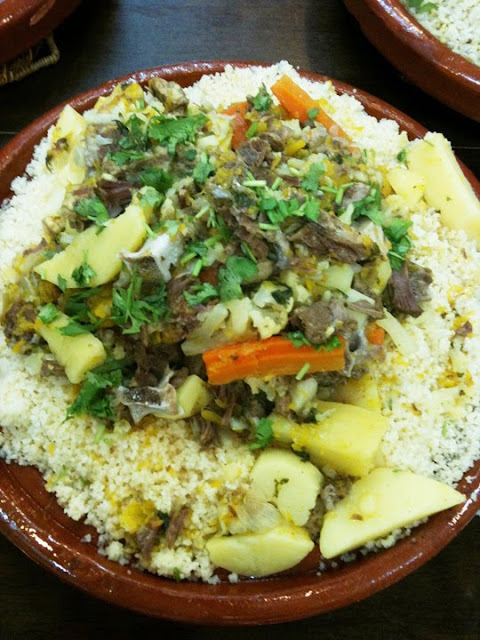 On that day, he got bring some left-over of lamb couscous which he and his wife can not finish the big portion. i tried the lamb rice.. omg.. its really nice! i never have this kind of good feel when eating lamb. My colleague said their Chicken Tajine was nice too! Must try! Since that day, i said to myself, i must try it out both! Eat the whole portion by myself! Taken with my SE W610i - Poor quality photo. Since its was my 1st time visiting, i tried to order Chicken Tajine but was told chicken tajine need to pre-order or place order 2 hours or earlier before coming as the process to cook chicken tajine took a lots of time. So we just order Lamb couscous rice for 1 person portion and roasted chicken rice. Still the main focus is on Lamb Couscous! Its was same good taste as that day i tried the left over brought by my colleague! Im loving it. On the left is the chili source, a cold source, which i like it very much. My friend commented that, normally she did not eat lamb as the lamb have some sort of smell which she dislike, but this dish she have totally have different view! She said she going to bring her family to try it again. Adil shd be the owner of the Olive Branch Cafe. Yesterday, im just come to know that Olive Branch Cafe got their own blog and twitter too! Glad to know that! They closed on Sunday! Argh.. last Sunday, i was free and whose know they closed. Lucky i got call the owner before depart from house. Call them in advance to order to avoid disappointment! Tender chunks of lamb, potatoes and carrots served on a bed of fluffy, buttery couscous served with chickpea and lamb stew. A traditional Moroccan dish lovingly prepared over 2 hours to achieve the perfect consistency and flavour of the couscous. Guess, the picture above is different from what i have is because im ordering 1 person portion, whereas the pictures above should be 2 person portion or more which placed with thick clay of plat which directly used for cooking. Thanks you my colleague on his good adventures which lead to me knowing this great Moroccan food at Ara Damansara although its abit far from Setapak! Im waiting, when im got the chances to have my Chicken tajine! Either busy or cant get friend to join along! How nice if i can share with her. 1. If you are coming down the NKVE, take the exit (on the right) after the Subang Toll Plaza and drive as if going towards Subang Airport on Jalan Lapangan Terbang Subang. 2. Go straight (do NOT go on flyover/ramp), bear left (Saujana GCC will be on left) and keep driving until you reach the traffic lights. 3. 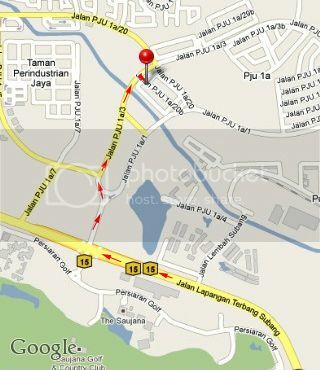 At the traffic lights, turn right under the flyover to enter Ara Damansara. 4. Follow the road until it splits, take the RIGHT fork and drive on. 5. 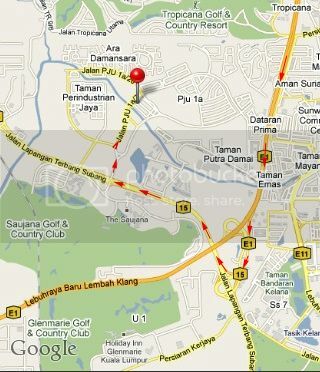 Take the SECOND turning on the RIGHT (at Bridgestone Tyre Shop) onto Jalan PJU 1a/20b. 6. Drive ahead for about 100m and The Olive Branch Cafe will be on your LEFT.